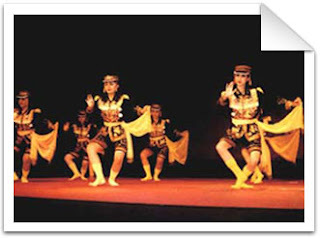 Traditional dance: Dolalak is the product of culture which appeared and grow in Purworejo regency Central Java. In the beginning of its appearance, Dolalak in the colonialism of Dutch in Indonesia, about 1915. This art is the result of acculturation between Dutch culture and Indonesian or west and east. It can be seen from the costumes and accessories, are similar with the Dutch army. The costume which are worn by the Dolalak dancers like dress with long sleeves with insignias shoulders, shorts, hat and sock and completed with sunglasses and sampur. 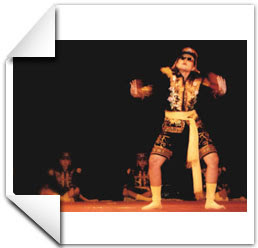 Dolalak dance is very attractive with a lot of movements which are unique and specific like kirig, ngetol, lilingan e.t.c. and also movement like “waltz dance” and make line like Dutch troops. Beside that, we also insert magic by inviting indang a spirit who come to one of dancer soul. The coming of the spirit to the dancer soul is called trance or mendem. The naming of Dolalak derives from musical notation do la la. In the beginning this dance was performed by men, but in the development, now the dance is performed by female, ussualy performed in one whole night. And the accompanying music is kendang, terbang, jidhur (Javanese gamelan orchestra) and the vocal.